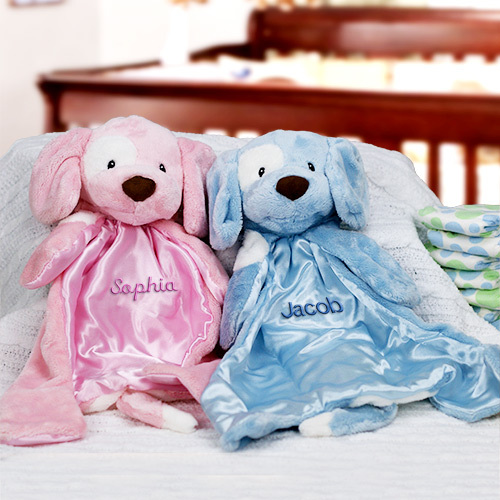 Give this adorable, lovable, cuddly doggy Baby Blanket is soft plush on the outside and smooth satin on the inside as Unique Baby Shower Gifts. Nap time is sure to be welcomed by your little one with this warm and comfortable puppy blanket embroidered with their name. These soft blankies also make for great personalized baby gifts to give to any baby boy or baby girl. I bought this for my niece and it was adorable. Very well made as well. She loved it. This is my second purchase. I haven't seen it yet but the first one was great. Shop more personalized baby gifts to find adorable ways to welcome a newborn into the world, or celebrate Mother's Day with Personalized Gifts For Moms!